Separates the thoracic cavity from the abdominal cavity (the word diaphragm is derived from the Greek ‘diáphragma’, meaning partition). Undergoes contraction and relaxation, altering the volume of the thoracic cavity and the lungs, producing inspiration and expiration. In this article, we shall look at the anatomy of the diaphragm – its attachments, actions and associated neurovascular structures. Fig 1.0 – The diaphragm is split into two lobes, left and right. Note the vertebral attachments of the diaphragm are the left and right crura. Lumbar vertebrae and arcuate ligaments. Costal cartilages of ribs 7-10 (attach directly to ribs 11-12). Xiphoid process of the sternum. Right crus – Arises from L1-L3 and their intervertebral discs. Some fibres from the right crus surround the oesophageal opening, acting as a physiological sphincter to prevent reflux of gastric contents into the oesophagus. Left crus – Arises from L1-L2 and their intervertebral discs. The muscle fibres of the diaphragm combine to form a central tendon. This tendon ascends to fuse with the inferior surface of the fibrous pericardium. 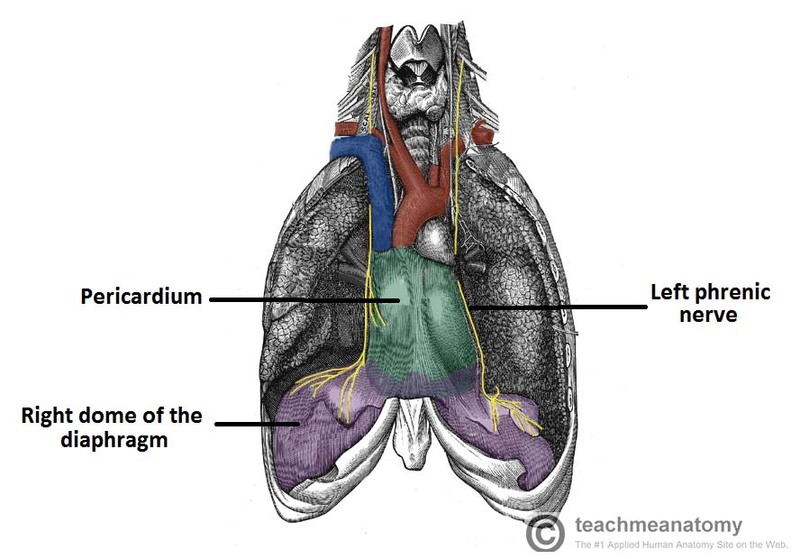 Either side of the pericardium, the diaphragm ascends to form left and right domes. At rest, the right dome lies slightly higher than the left – this is thought to be due to the presence of the liver. The diaphragm divides the thoracic and abdominal cavities. Thus, any structure that pass between the two cavities will pierce the diaphragm. 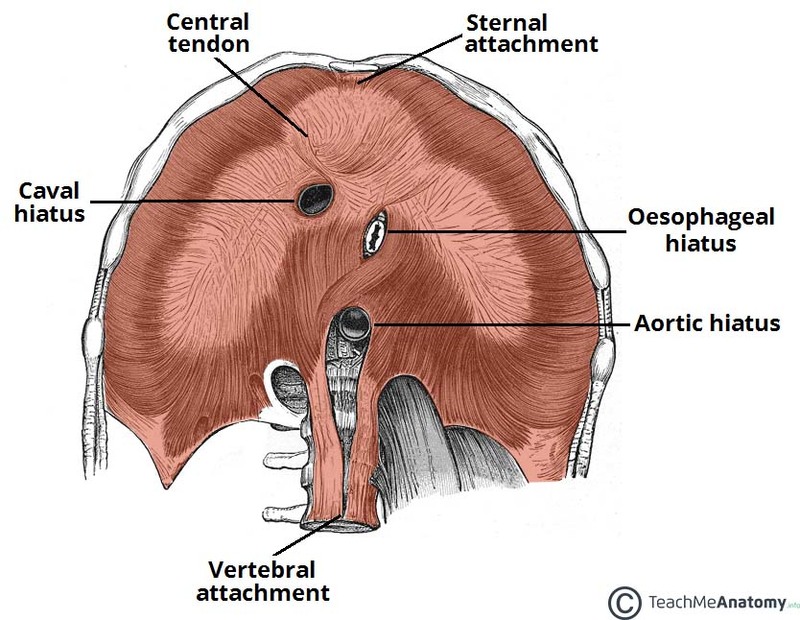 A tip for remembering the vertebral levels: vena cava has eight letters (T8), oesophagus has ten letters (T10) and aortic hiatus has twelve letters (T12). Fig 1.1 – View of the inferior surface of the diaphragm. Note the three openings. The diaphragm is the primary muscle of respiration. During inspiration, it contracts and flattens, increasing the vertical diameter of the thoracic cavity. This produces lung expansion, and air is drawn in. During expiration, the diaphragm passively relaxes and returns to its original dome shape. This reduces the volume of the thoracic cavity. The halves of the diaphragm receives motor innervation from a phrenic nerve. The left half of the diaphragm (known as a hemidiaphragm) is innervated by the left phrenic nerve, and vice versa. Each phrenic nerve is formed in the neck within the cervical plexus, and contains fibres from spinal roots C3-C5. The majority of the arterial supply to the diaphragm is delivered via the inferior phrenic arteries, which arise directly from the abdominal aorta. The remaining supply is from the superior phrenic, pericardiacophrenic, and musculophrenic arteries. 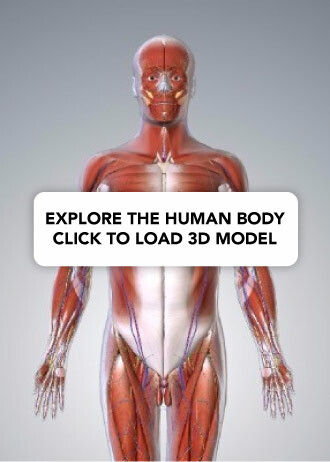 The draining veins follow the aforementioned arteries. Fig 1.2 – The anatomical course of the phrenic nerves, which innervate the diaphragm. Fig 1.3 – Chest x-ray, showing paralysis of the right hemidiaphragm. Mechanical trauma: ligation or damage to the nerve during surgery. Compression: due to a tumour within the chest cavity. Myopathies: such as myasthenia gravis. Paralysis of the diaphragm produces a paradoxical movement. The affected side of the diaphragm moves upwards during inspiration, and downwards during expiration. 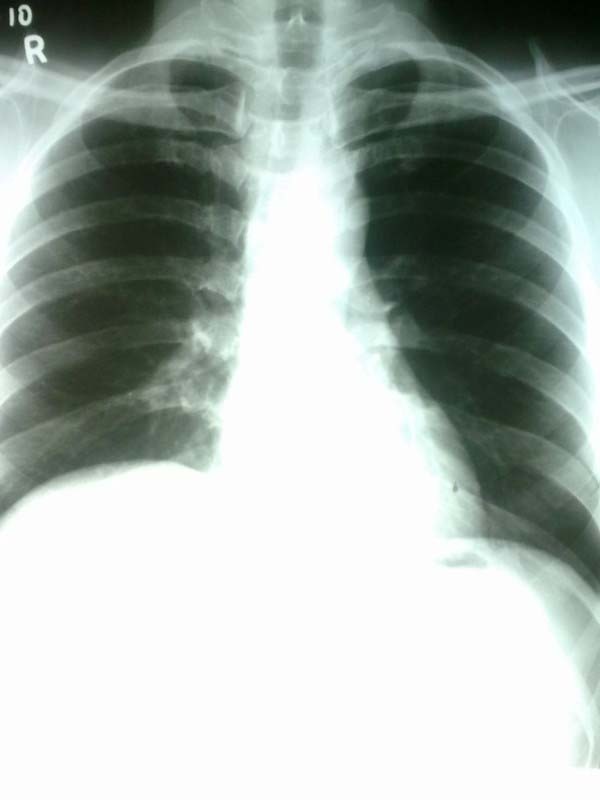 A unilateral diaphragmatic paralysis is usually asymptomatic, and is most often an incidental finding on x-ray. If both sides are paralysed, the patient may experience poor exercise tolerance, orthopnoea and fatigue. Lung function tests will show a restrictive deficit. Management of diaphragmatic paralysis is two-fold. Firstly, the underlying cause must be identified and treated. The second part of treatment deals with symptomatic relief. This is usually via non-invasive ventilation, such as a CPAP (continuous positive airway pressure) machine. 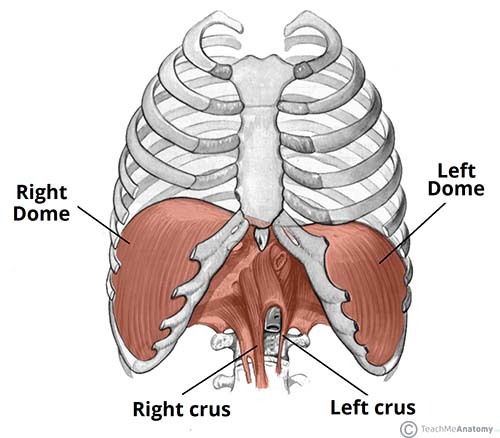 Which structure does the central tendon of the diaphragm fuse with? At what vertebral level is the oesophageal hiatus situated? What is the innervation of the diaphragm?